FindMakarov.com is probably related to an upcoming fan project rather than a new Modern Warfare title. The mystery of countdown website FindMakarov.com may have been solved. Geoff Keighley of GameTrailers and other videogame-related productions has uncovered some of the truth behind the Call of Duty-esque site and determined that it's definitely not for a new game. When FindMakarov.com first appeared with its countdown clock, various factors led to speculation that a Modern Warfare 3 announcement was incoming. However, Activision officially called the website a hoax if it was claiming to have anything to do with a Call of Duty game. Keighley writes that the site is actually the creation of We Can Pretend, which he describes as "an independent Toronto, Canada-based creative collective." He was told that We Can Pretend plan to launch a Call of Duty inspired project on March 2 that will be "visually spectacular." An image was sent to Keighley that makes the project out to be a fan film. 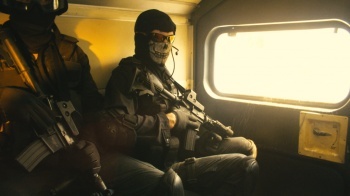 The image shows an actor dressed as Simon "Ghost" Riley, the soldier from Modern Warfare 2 that wears a skull balaclava and is the rumored focus of a Modern Warfare prequel. We'll find out the truth on March 2. Fans that were excited for a new Modern Warfare title can take solace in the fact that one is probably coming out eventually, and in the meantime can watch whatever We Can Pretend have put together.